I am so happy to be partnering with Princess Cruises for this Pizza Salad post, all opinions, photos, and recipes remain -as always- my own. Please do yourself a favour and look into booking a 7-Day Caribbean Cruise with my friends at Princess, you’re guaranteed to Come Back New! 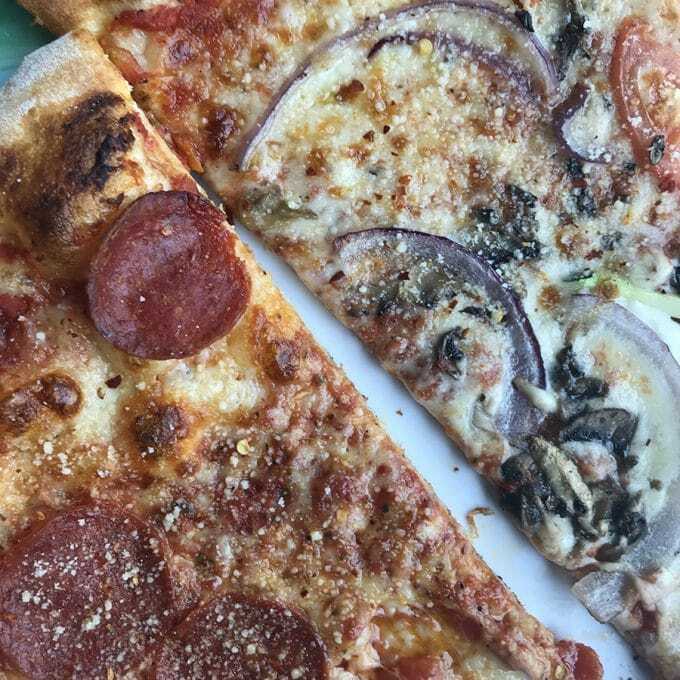 A couple of weeks ago, when my husband and I were on the best Caribbean cruise we’ve ever experienced, I discovered the pizzeria on board. If you know me, you know that pizza is my kryptonite. The pizza on the Caribbean Princess was perfect. It was hand tossed and stretched dough with the ideal amount and type of toppings, baked right in front of me while I waited. But if you know me, you also know I’m a maniac for salad, and the 24-hour salad bar aboard the Caribbean Princess was magnificent. My husband and I had epic salads for lunch every single day. Ya know, with my pizza slices. Basically, it was heaven. And then I was home. Sigh. It always has to come to a close eventually, but I really missed the pipeline to pizza and salad. While perusing Instagram, I came across a *GASP* pizza salad in my friend Shari’s feed, and knew my girl was onto something good. 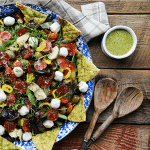 I hatched my plan, shopped my list, and created this salad that handily combines two of my all time favourite foods into one irresistible Supreme Pizza Salad: this salad is no boring, average salad. What ingredients do I need for a pizza salad? Now friends, I really want you to go great guns and try this mega supreme pizza salad in all its enormous, fully-loaded glory, but if you are a pepperoni pizza kind of guy or gal, or if you just plain don’t want to gather all the little goodies for the pizza salad, feel free to pare it down to the pepperoni, cheese, pesto pita chips, and dressing. 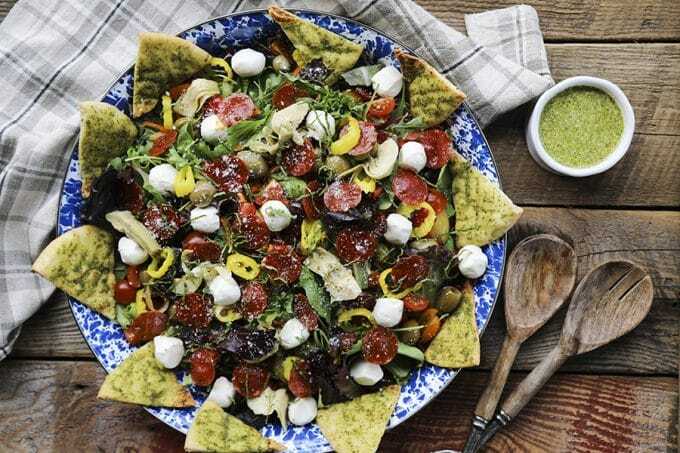 If you go for the full shebang, you’ll be adding pepperoni, homemade pita chips, artichoke hearts, mini mozzarella balls, marinated Italian style olives, cherry tomatoes, sun-dried tomatoes packed in oil, pepperoncini rounds, grated Parmesan cheese, and homemade 3-ingredient pesto vinaigrette to your greens. If you have to fire up your oven in the summer, make it do double duty. You can bake the homemade pita chips recipe and the pepperoni to crisp them up at the same time on two pans. Speaking of crisping the pepperoni, keep your eyes peeled because it goes from almost done to charcoal pretty quickly. The process is fast; you really don’t need to have them in there for long. And they’ll darken and crisp up further as they cool on paper towels. It’s better to go a little under than to go too far with it. I prefer to crisp the pepperoni for our Supreme Pizza Salad on parchment or foil for easier clean up because the pepperoni gives off quite a bit of grease. And on the subject of grease, I prefer to cool and drain the crisped pepperoni simultaneously on a couple layers of paper towel. If you dig the grease, though, there will be no judgement from me if you go straight from the pan to the salad with them. If you cannot find mini mozzarella balls easily, you can substitute 1 cup of cubed mozzarella cheese or torn fresh mozzarella from a ball. As far as greens go, the best choices for this salad are mixed spring greens, arugula, or a combination of those. When choosing sun dried tomatoes for the pizza salad, choose ones that are packed in oil, and preferably marinated in Italian herbs as well. The same applies to the olives. I am lucky enough to have a Wegman’s with an olive bar where I can choose Italian marinated olive salad. If you don’t have this available, any marinated olive with herbs and garlic will do. And if that is not available, you can substitute whichever olives you prefer on pizza. If you want to prep this salad ahead of time to be served later in the day, you can separate each of the toppings into a container and store it tightly covered in the refrigerator. Assemble right before serving for best taste and texture. If you love Pizza Salad, you’ll love these pizza goodies, too! Use these to make Supreme Pizza Salads more easily! Supreme Pizza Salad: this salad is no boring, average salad. 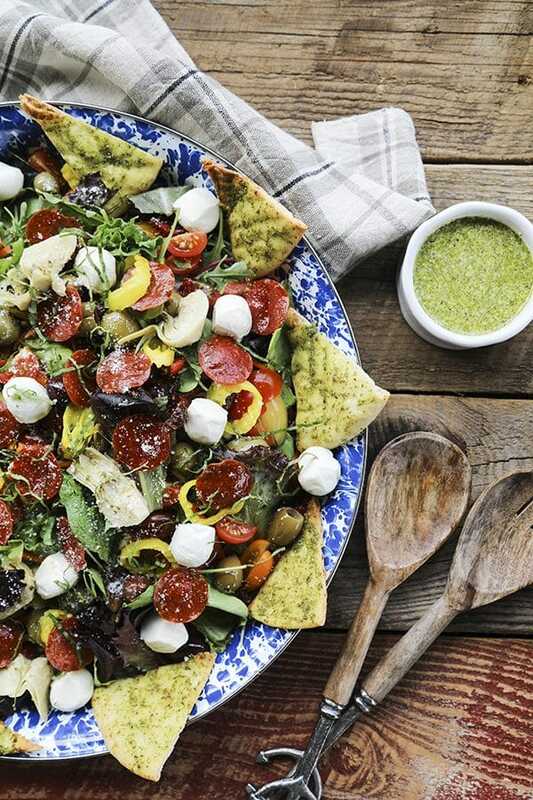 Mixed greens are tossed with crisped pepperoni, pesto pita chips, artichoke hearts, mini mozzarella balls, marinated olives, cherry tomatoes, sun dried tomatoes, pepperoncini, and a flavourful pesto vinaigrette. Preheat oven to 400°F. Line a baking sheet with parchment or foil for easy clean up. Arrange the pepperoni in a single layer with space between each slice. Bake for 5 to 8 minutes, or until they have given off quite a lot of fat and they are crisp around the edges. Transfer to a paper towel lined plate to cool and drain. Arrange the salad greens on a large platter. Tuck the pita chips around the edges of the greens, layer the pepperoni on the greens, then scatter all of the remaining toppings on the salad. Serve immediately with the pesto vinaigrette. Yummy! I have to try this! I love pizza and salads too! Thanks for sharing! Thanks, Kaleigh! I hope you love it!